Eeek! I’m a little bit obsessed with how cool our latest winter craft turned out. 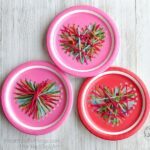 I came across some fun snowflake paper plates at my local Target and was struck with the idea of how to turn them into this gorgeous paper plate snowflake yarn art. 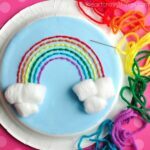 Not only is this a perfect activity for the winter months but it’s great for beginning sewing and fine motor skills. You can see the picture below with all the holes showing through the bottom of the paper plate. This is an important step so the holes are prepped for bringing the yarn needle through, and also so kids can see the outline of where the thread will go next. 2. Cut off a big piece of your yarn. Thread one end through your yarn needle and tie a knot at the base of the needle. Then tie a double knot at the end of the yarn. 3. 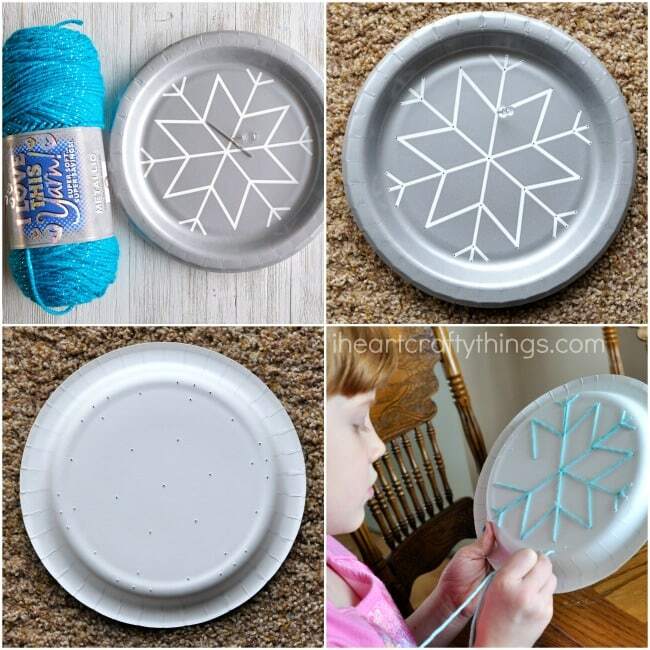 Thread the needle and yarn through the center hole in the plate on the front of the plate, then use the holes you poked and the pattern on your paper plate to thread through the snowflake pattern. You will end up going through some of the holes a few times to get the pattern complete. When you reach the end of your snowflake pattern cut off any excess yarn and tape the end of the yarn onto the paper plate. 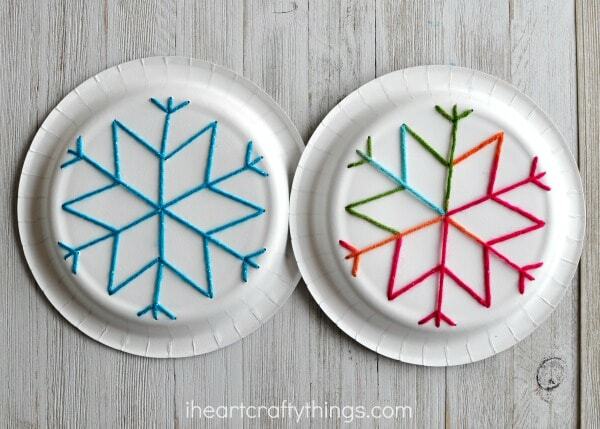 The end result of the paper plate snowflake yarn art is so gorgeous on the back of the paper plate. I loved how both the multi-colored snowflake turned out and the blue ones. 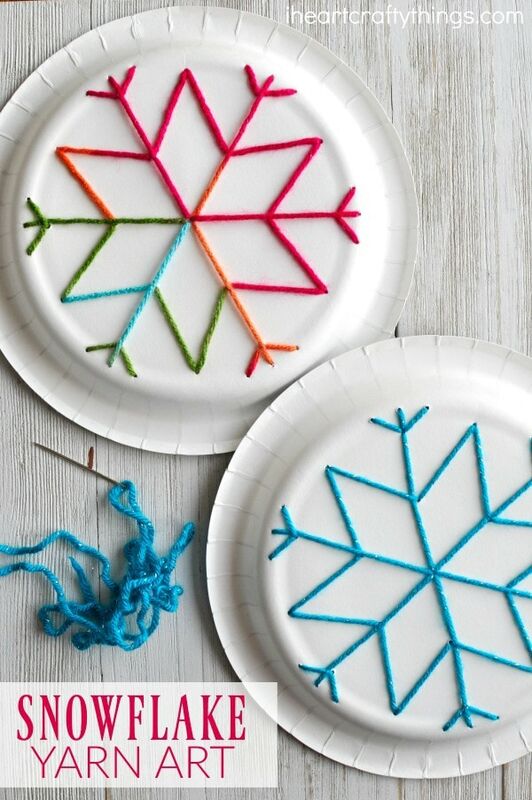 You can make several and thread them together to make a fun winter themed banner to hang in your home. Or decorate your snowflakes even further with sequins, glitter glue and craft gems. While my Kindergartner completed this craft with me it was a big challenge for her. I had to stay by her side and guide her through about half of the snowflake before she was able to be let loose on her own and complete the snowflake. Because of this, I wouldn’t recommend this for preschool students unless you plan on doing it as a one-on-one activity with them. 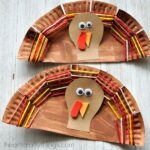 Elementary age students of all ages will enjoy the challenge of this craft though. I’ve had a few people ask me this so I’m hoping to add a better picture tutorial to show you how I did it in the next few days. Hahaha! Mine wasn’t but yes my daughter’s was quite a mess! I will see if I can grab a photo to post in the next few days. 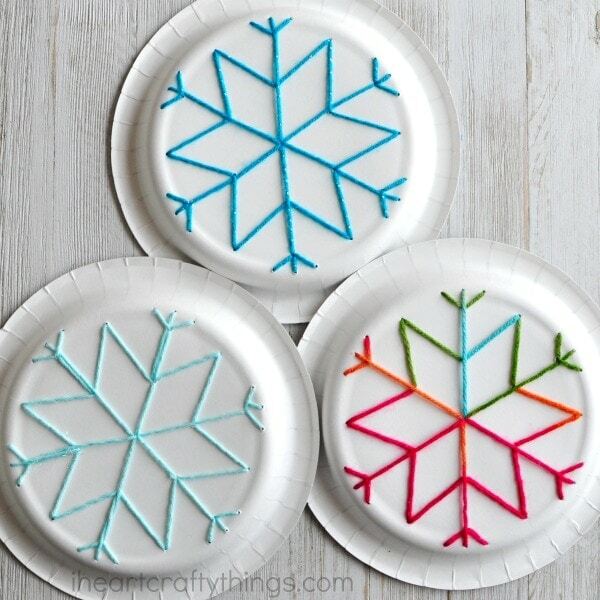 Where can i find this pattern for the printable snowflake ? I need to find these plates and all the snowflake plates I see this year are small ones. Help!!! What was the brand of the plate? I am unsure of the brand name I purchased last year but I got them at Target. The plates I used are actually more of the dessert size so they are a bit smaller. Ahhhhh!! Most helpful tho. And probably quicker too. I am going to do it as a station for my 2nd graders’ winter party. I think I am going to do the tape instead and a smaller plate is much easier. Thanks for the quick reply:)! I found them at Target in red and white!!! Yay!!! I hope the kids enjoy the activity!